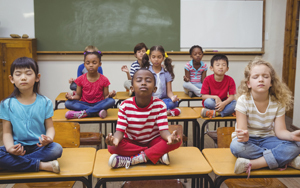 What is mindfulness, and what does it have to do with your child with learning disabilities or ADHD? The terms mindfulness and meditation are often used interchangeably; either way, the critical aspect of mindfulness is the ability to focus on this moment—the “here and now.” Kids with LD spend a lot of time worrying about what’s gone wrong in the past, and fretting over challenges they anticipate in the future. Some panic just thinking about an assignment in reading, writing, or math. Mindfulness means being able to focus on the current moment and letting go of other thoughts. The advantage of practicing meditation and focusing on the now is that it gives your child a tool to self-calm, and the ability to focus on just what’s happening, rather than past worries or future fears. In that calm moment, she can apply a strategy, such as thinking positive thoughts (“I can give it a try, and I can get help if I need it.”). She can then use other learned strategies for managing the situation at hand. The critical part of this is getting to that calm moment. No one can think when their anxiety level is too high. The practice of mindfulness involves learning techniques of meditation to let go of feelings and thoughts and to find that calmness. Scientific studies have found that daily meditation turns off the stress response in the body, and structurally changes the brain to be more stress resilient. With daily practice, the body becomes conditioned to relax, so just doing meditation for a few minutes can be effective in the moments when it’s needed. The mindfulness practice of meditation is one in which you focus on breathing, sounds in the environment, or some other aspect of sensory experience and let go of the thoughts that come along. What’s important is to find a form of meditation that works for your child. Research shows that any form of meditation works equally well. This includes techniques such as repeating a mantra (word or phrase), muscle relaxation, yoga, visualizing something positive, and listening to music. It also includes activities such as running, swimming, knitting, and walking. Having thoughts is a normal process of the mind; when you realize you’re thinking, you just go back to your focus. Many people find guided meditations to be the easiest; you simply listen to someone giving you directions for what you’re doing. Once you’ve found a form of meditation that works for your child, help her practice it regularly. Start out with a short amount of time and build up to about 10 minutes, if that’s possible. I recommend practicing at a regular time of day (e.g., bedtime) so that it becomes routine. It’s OK to provide an incentive for practicing. It’s important to send the message that this is a life tool, and not just for children with challenges. What works for your child will actually work for you and your whole family, and will set an important example. And you get the added benefit of having a calmer family! Children need to be self aware at the first feelings of anxiety and know that’s a cue to practice a minute of their meditation technique to calm down. However, this is a pause, not a magic cure. Once calm, your child must have a productive path forward. It’s important that the strategy to use for handling the situation after calming down is something known, that works, and that your child can do independently. It may help to have it written down. It’s also important to understand that your child may not recognize that a strategy used in one situation can be used in another. Often that has to be explained. Marcia Eckerd is an evaluator, consultant, and therapist who specializes in working with children with NLD and autism-spectrum disorders. She is also a member of Smart Kids’ Professional Advisory Board.